TigerDirect has free Vidmount Wall Mount after $15 rebate. Vidmount VM40F Wall Mount Mount your TV on the wall with the Vidmount VM40F Wall Mount. It helps to save space and adds a sleek look to the TV. With a weight capacity of up to 40 lbs, it gives a sturdy support to the TV and a safety screw ensures to keep the TV secured. It can be used to mount TV of 13” to 37” screen sizes and is compliant with 75x75mm to 200x200mm VESA mount. 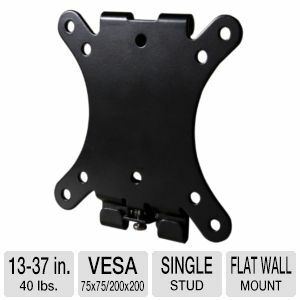 This black colored wall mount is a single stud fixed mount. The Lift n’ Lock™ feature makes installation a single-person task and. Its low mounting profile of 0.5” ensures to keep the TV close to the wall along with allowing proper air circulation for keeping the TV cool. Purchase the Vidmount VM40F Wall Mount now! This rebate must be purchased by Saturday November 28th, 2015.